My Top 10 Tips Ideas for Promoting a Healthy Attitude to Food for My Children. I have always had a difficult relationship with my body, particularly my weight. My family were fit and healthy; Dad worked long days on the farm and when he wasn’t working he was doing judo. Mum was mad about her yoga and still is, so body image was a positive thing in our house. So where did my poor body image stem from? I am not sure I know the answer to that question, or ever will. Would knowing the cause, give me a cure? Probably not, but maybe it would help me with my own children and their self-image. With so much talk of childhood obesity, I am lucky in that is not a concern for me. My children take after their naturally slim Dad, he has no idea about what it is like to diet; I hope that they grow up the same as him. But they have inherited his sweet tooth, so teaching them about healthy food, versus yummy food is an ongoing challenge, it is easy to let it slip when their weight is not a problem. Their weight is always on the under rather than over side of the healthy scale, so at the moment the idea of cutting down because of weight is alien to them but getting them to be able to manage their own eating with a healthy attitude is something I desperately need them to have. I was a big eater and luckily have the height to hide my weight, as I have been told many times. Problem is that I think I might need to gain a bit more height to cover my weight these days; I may be under height for my weight now. In our traditional Yorkshire farming family, food was a big part of our lives. There were desserts with every dinner and cakes with every tea. I regularly spent my pocket money on chocolate on the way to school and then again on the way home. Fridays were Mum’s shopping day, so there would bowls of peanuts and chocolate bars to snack on. We all ate the same meals as my Dad, who needed his carbs to keep warm in the freezing Yorkshire winters and fairly chilly summers. I think the plan was that we would eat smaller portions of the high calories meals, but my mind has a problem telling me when I am full, so I am not great with ladylike portions! It is easy to copy the patterns of my parents, even though that is not how I eat now. Very long story short, I grew up into a, some might say curvy, others said blobby (yes, I did hear that comment about me) woman. I left home at 19 and began a journey of discovery about what I should and shouldn’t eat. At 19 the weight came off easily; with the big change in diet that came with cooking for myself; my staple diet was soup and toast, I began to take a whole new shape. This is going to be a whole series of the blogs about weight, as there is much to tell, but the point of today’s blog is to talk about the things I have learned a little later than is useful about feeding my own children. Everyone’s appetite is different; the advice given to adults is to finish eating before feeling full, as the brain takes time to tell the stomach it is full – or in my case it skips that part and goes straight to telling me to eat chocolate. I am not averse to snacks, as long as they are healthyish, as I know my youngest is better with more regular small meals than 3 large ones. I am a super-fast eater, so much so that I have polished off a plate of food before my brain even computes that I have started eating. It is hard at school to eat slowly, my youngest struggles with the others eating so much faster than her; she often comes home hungry as she hasn’t had time to finish her lunch. I don’t tell her to eat faster, we just find her something to eat when she gets home. Refined sugar is not needed for energy, in fact it is not needed at all. As my Mum used to say, there is no pudding until the savoury stuff has gone. If they are too full to finish a plate of savoury, then it is no to pudding, harsh but true, children. It seems to be accepted as adults that we don’t like certain things, but not so much for children; we all have different tastes and children’s tastes are no exception to that. I stand by point 4, but we need to really try something to be sure it is not for us. Textures are an issue that many are unable to work around e.g. I love peaches, but can’t stand the feel of the skin, so for me they have to be peeled. I don’t like the texture or the taste of pears in any form, that is just the way it is, despite trying many times. If a child doesn’t like something, try presenting it in a different way; peeling it, cooking it, hiding it within other foods. I am not a great lover of raw peppers but, I find the taste subtler if cooked; I prefer raw carrots to cooked ones; there is no logic or rules to what we like and why. It is a painful process but we need to help our children find their own likes and dislikes. We once tried to get our oldest daughter to try new foods, the deal was that she would try a small piece of food a few times to see if she liked them or not. She refused to even try many foods at least once, so we decided that she had to try things before she made her decision about them. Then grape gate happened! Her Dad decided to take on the task of getting her to try grapes, she refused, he begged, she refused again, he got cross, she still refused, he got more cross and she ran off to have a huge tantrum. No grape has since passed her lips. Force feeding, or bribery is not for us, she would starve rather than eat something she doesn’t like or believes she doesn’t like. We find that eating with friends is a good way of introducing new tastes, she is a little more receptive to trying something if her friends are eating it. Try to keep a balance of protein, carbs and vegetables for every meal and explain about the reasons why. Talk to them about nutrients and the reasons we eat what we do, there are some great TV programmes about health and nutrition, so if they don’t believe you then they might believe someone on TV. I am not great at this bit, all my two ever want to do is make cake, but they are getting a feel for cooking and hopefully we can move onto something savoury one day. There are no ‘good’ foods, ‘bad’ foods, reward or punishment foods. I was given food as a reward too many times, I associated food with comfort and the good things, later this turned on me (a story for another time). I don’t like to hear that food is bad, everything in moderation and all that. Education is the key; a ‘bad’ food is just a food that we should eat a little less of. Mine love sweets and chocolates, but they know to ask me before digging into their stashes and ‘usually’ accept it if I say no and give my reason why. This has been a long challenge though as my oldest does not like the word no! Life is just too short to fight the good fight every day! Joking ….. I don’t even like McDonalds and yes, I have tried them. The kids eat McDonalds, but it is a convenience when we are out and they know that. With busy lives, we all need convenience; I find eating on the go is tricky to keep healthy, so I often pack a few healthier things to take with us. It can be a pain, but so can finding something for them to eat on the go without spending a fortune. I have an unhealthy relationship with food and I need to work especially hard to ensure my children don’t develop the same relationship. I wish it was all so much simpler and the things we loved to eat were the things that were the healthiest to eat, oh well, I can dream. Bank Holidays – Compare the before and after children long weekends. It’s been a lovely Bank Holiday weekend; the weather was amazing and we were all together. Made all the sweeter by the fact that the day’s pay I lost, I can now get another day. The lazy days of spring / summer had me reflecting on how life has changed for us since the arrival of our little bundles of joy. Our bundles are now large packages of delight, with attitude. We would finish work and head off to the pub, probably until closing time and then maybe onto someone’s house to finish off the evening with more drink and good conversation. It’s finish work, pick up child 1, return an hour later and pick up child 2, cook dinner for kids, sort bags, sort uniform, ensure homework is all planned for, pack bag of supplies for 60-minute trip out, and then off to the pub we go. We have 2 great kids who do allow us a one drink trip to our local pub on a Friday night, this is a Friday night ritual, not just for bank holidays. In the summer there is the not so secret garden for them to play tag in and generally drive all the other drinkers mad with their screaming. Hence the reason it is a one drink thing, as I think any longer may result in us being barred. This Bank Holiday Friday they made a friend, so there were three screaming children running around the not so secret garden, made even less secret by our screamers. So, after countless, be quiets, calm downs, stop running around the tables, mind those people, be kind to your sister and play nicely, we finished our drinks and headed home for the usual bed time routine. After that, it’s our turn to eat, and then it’s not long until we collapse, exhausted into bed. Lay in bed till around 9 ish, maybe a little later, depending on the night before. Leisurely cup of tea, read the papers or a magazine, generally, gently ease into the day. Bank Holiday with friends might mean a trip to the shops, a stop for some wine, followed by the prep required for a big night out, then it would have been the big night out. If dancing was involved, this could take up pretty much the whole night, falling into bed just before dawn. A more couplie Saturday could have been a similar ease into the day. Lunch and a walk somewhere, followed by evening out with other couplie friends. It’s a 6.30 start – don’t you just love the light mornings? They both have terrible fear of the cat, so have to be escorted past the cat and down the stairs, but thanks to Sylvanian Families, they were entertained for an hour before demanding food, meaning a welcome return to bed for parents. Then it’s a 7.30 restart and, by this time they are up to full speed, bickering about everything and in full on demand mode. 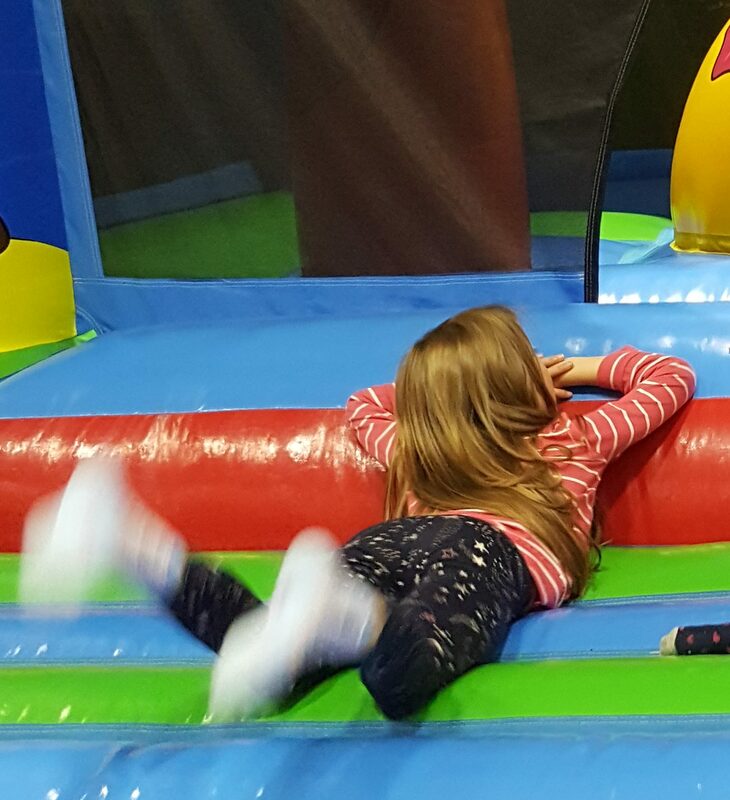 Find bouncy castle – total result that the thing still inflated, an inflate / deflate it, repeat many, many times over the weekend, as apparently it is fun to be on it when it deflates. Shed / play house hunt for balls, all of which are in the neighbour’s garden. Luckily this was his weekend to go do a ball return, about 10 balls returned on Sunday morning. Realisation that we had forgotten sun cream on one arm, as it started to go red, there was quick dash to cover it in as much factor 50 as we could find. Dinner – to be laid out in the garden, then cleared; there is not a chance either of them could possibly carry a plate into the kitchen. Provide tablets for indoor, cooler entertainment while we tidy away all of the garden equipment. After this it was time for them to go to bed, luckily tired after a day outdoors and an early start. We could then get on with some of the DIY that had been cast aside in favour of parenting demands. Bottles of wine and cider opened. Dinner. Collapsed into bed exhausted. A day of lazing around watching TV, reading, maybe a lunch out and a walk somewhere. It’s a bank holiday weekend, so there may well be another evening in the pub. We were joined by a 4 ft unicorn (no this was not a drug induced hallucination, we actually have a 4 ft cuddly unicorn) and 2 children around 7 am. Then, we repeated all of Saturday, but without the trip to B&Q. This time we decided to delight them with a trip to the local steam fair, which is always popular, until we refuse to pay for the Hook a Duck game and all descends into despair. Beach trip for sure, no worries about sitting in traffic as the music would be on, there would be no rush to get home, so if it took forever to get there, then that was not a problem. Few drinks, snacks a good book packed and we were all set to go. A beach trip is now like an arctic expedition, planning, packing and preparing for 1 little day out is now more effort than planning for 2 weeks away pre-children. Children can’t cope with traffic jams, it is a proven fact that they melt down after a whole 5 minutes in the car. We decided that this unseasonably hot day was no day to be fighting the crowds (I sound more and more like my own parents every day… argh!) Needless to say, the DIY had over run so the one planned social event of the weekend had to be postponed, possibly the next months’ worth of social events may need to be postponed, DIY is quite time consuming! We decided that Monday’s mini outing would be a picnic in the park, when I say picnic I mean some swiftly heated mini sausage rolls and a cheesy dipper each (not exactly a planned picnic), followed by a trip to a local river for some paddling. I had forgotten just how much rain we had had over the last few weeks; the river was more of a wading / swimming event and for the none swimming duo, it proved a little too tricky, muddy and it seems that pond weed feels funny on their feet. DD1, “They look like pants.” Followed by lots of giggling and sniggering, plus me telling their Dad not to look as the bikini wearer only looked about 15. “Mummy, my pumps are bad, they feel like I have pooed myself!” Not exactly what you want to hear on your relaxing Bank Holiday weekend. All that said, I would not change a thing, time with the kids is the best. The ordinary days make for the most fun sometimes. It’s all about making memories, no matter what you do, enjoy it and remember it. Anxiety, work and me – coming to terms with my anxious self. I have never come a real conclusion about what I should be, or should not be doing, when it comes to work; I think the ship has sailed on finding that conclusion. All I can do now is find something that pays money for doing something that I enjoy. There are many practical reasons as to why I didn’t find my way one the path to a career, but recently I have reflected on the whole piece, as the history of it all comes back to bite me. I am now wondering if practicalities were the reasons, or the excuses. I am not exactly out and proud about my anxiety, but I am coming to terms with the part of me that is exactly that, a part of me. I managed to work with anxiety on my shoulder for many years, but jobs came and went with alarming frequency, especially as I got older. When I arrived into parenting, I found that work was a challenge to fit in around all that being a parent brings. The biggest problem of all being the cost of paying someone else to look after my children, especially when I wanted nothing more than to be there for them. I started on the road to self-made millionaire and began my own business, to fit in around the children. I soon realised that millionaire was never going to happen; in fact, I was happy, sometimes even ecstatic, to get paid anything at all. That helped me come to terms with losing the bigger salaries that I had earned in the past. My business was tough and lonely, anxiety makes sales and marketing an almost impossible mountain to climb. I found myself almost apologising for trying to sell my business. So, when my children started school I began to volunteer in their classes for a little human interaction. This was fun; there was little or no pressure on my permanent state of anxiety, I felt comfortable with the children, challenged, but in a positive way. It gave me an excuse not to work on building my business, but I needed to earn a wage. So, began the journey into the paid world of education; job one was Lunchtime Supervisor (dinner lady to those outside of education), it was OK, but I started to feel the strain of the anxiety. The thing that I have discovered in education is that you are told how not to do something, often with blunt force, but not always told how to do things. I began to feel panicked and out of control, I did not know what I was doing, how could I perform to the best of my ability, what if I failed, what if they didn’t think I was good at the job, or didn’t like me? These are just a few of the questions that an anxious brain will ask over and over again. But despite the self-doubt and the anxiety, I managed to do 1 ½ hours a day and not get fired. The wage packet at the end was tiny, but I was only working 7 hours a week, 38 weeks of the year, so what could I expect. I needed to upgrade to classroom. My family had to up sticks and relocate, so the failing / abandoned business got put in a box and I decided to face the fear and do it anyway; I trained to be a Teaching Assistant. Now this is the perfect job for a school mum, isn’t it? Work school hours, sort of, have the holidays off with pay, work with children, give something back and other honourable thoughts. The job is all of those things, except to a person with anxiety, for that person it is a minefield of challenges and agonising self-doubt. College was OK, study was manageable, the deadlines caused me anxiety, but the work I could handle. I was incredibly lucky to find a paid job, while I studied. I can tell you the practical reason for leaving the first TA job; it was that the cost of travelling to and from school did not make the tiny salary worthwhile. However, the real reason is that my crippling anxiety was making every day hell. People who have worked in education for a long time can become quite blunt, authoritative, or some might say a little bossy. I should say that this is not everyone, but there are a few who find it difficult to remember that the way they command a room of children is not necessarily the same way you should command a colleague. To be fair, these people are present in all parts of life, but for some reason, this job made it harder. Now to all you everyday folk, this is not a problem, you just politely remind them who they are talking to and go on your merry way. Miss anxiety, however, was felled by the cutting remark, or fearful of the barked command, I would scuttle off to do as I was told, my adult brain telling me this was wrong, my anxious mind telling me that I was useless at the job, getting it wrong, disliked. This made me falter in my role, become confused and anxious, the job that I could do well, suddenly seemed out of reach of my abilities. Anxiety leads to mistakes as our brains become confused and anxious, us anxious people can struggle to clarify and problem solve, mountains and molehills spring to mind. Jobs came and went; how lucky was I to keep getting new jobs after giving up on the old ones? The final paid school role brought me to where I am now, the lightbulb moment where it all made sense. When working in a school alongside a teacher, we are there to assist in anyway we can; there is not necessarily a structure to what we do, where we do it and how often we will be needed to do it. For a routine driven workplace, the job is different every day. Now that should make it a dream, and for me, who doesn’t want to like routine, it should have been perfect; how could I get bored if it changed by the minute? But my anxious mind could not gain the control I needed. I spent every night worrying about what the next day would bring, and every day worrying about what I was doing, was it good enough? The anxiety meant tears, frustration, confusion and an inability to see the wood for the trees. I became more and more stressed, breathless, I would wake in the night having night terrors, I would cry at everything and often did cry, either in the classroom or hidden in a toilet somewhere. The children made me feel amazing but broke my heart at the same time. Children are blunt, but funny, the truth can sometimes be hard to take. I found that my home life suffered as I was on a constant knife edge of emotions, angry one minute, crying the next. I realised that I was not able to cope with the lack of control needed to do the job, I had to take back the control as I was spiralling into a dark place. Is this the end? At the moment, I think sadly it is the end of my TA job, as every time I walk into the school as a volunteer, the old feelings return; I feel the nagging self-doubt, the panic, the fear of failing. Failing at what is a mystery to me – as a parent helper, there are no expectations on me, but my anxiety will not let that logical thought be true, I feel the need to perform. At the moment, I am focusing my attentions on other ‘controlled’ roles. Whether it is just me, or the me with anxiety, I don’t know, but I know that I am desperate to please, I consistently over perform, then burn out. I am told that the secret is to underperform and always have more to give. But with my need to please and constant seeking of gratification, that is just not in me, so for now, I will continue to over perform as best I can. A recent interview comment about my ever-changing CV certainly hit home, I am not sure that I can fix the past, but I can find a compromise with my demons within, maybe I can finally stay somewhere. I can fight my anxiety, as I have done time and time over, but it is exhausting, sometimes I just need to give it a minor victory and find a way to live harmoniously together. I have found that anxiety as a parent is harder to work with; as a mum I naturally give my all to my children, all of my courage and strength goes into what I need to do for them. That leaves the part that belongs to just me falling short of bravery. I will not give in and I will make something work, but every time I take a knock, my anxiety has a great time telling me how I deserve to fail. It is a shame that this job didn’t work out for me, but I could never be a brain surgeon either, is that a problem? I need to play to my strengths, which do seem to lie in organisation and order. I am currently trying a self-employed freelance role, which does not require me to sell my wares, but gives me enough control to feel good about what I do. There is even the occasional confident moment when something good happens. If I have learned anything over my many years of fighting my anxiety it is to find a way of working with it and not against it. In my next blog, I am planning to write about some of the coping strategies that I have successfully used. A short blog about our trip to West Dean Gardens and a few of my pics to show off, just an ordinary day out, but it is what family life is all about. I moved down to Petworth many years ago, before becoming quite nomadic and moving around the country too many times. I had heard about West Dean Gardens and kept meaning to go along, but never got around to it. As we were nearby doing one of our many child activities, we decided we would go along to see what it was like. We are always looking for places to take Grandparents, so it was a good opportunity to test it out. On paper, it doesn’t hold much appeal for children as there is no play area, but it is actually a perfect space to take children to just enjoy being outdoors. The gardens are attached to West Dean College of Arts and Conservation, which I guess is responsible for the upkeep of the gardens, as they are immaculately kept. The gardens are perfect for our 2 sets of garden mad grandparents. I was worried that the children might not enter into the spirit of our great outdoors expedition, but I was pleasantly surprised at just how much of a family day out it was. I would say it is a half day, rather than a full day, but definitely worth a visit. It is near to Chichester, a bit off the beaten track, but the sat nav got us there without a problem. Parking was free and there was plenty of it. The whole garden is laid to paths, so wheelchair and buggy friendly. I doubt that they would be keen on scooters, but I didn’t actually see a sign saying no scooters. We arrived just after it had opened, following our early morning dance class; it was not sunny, but it was dry, which I would say is a must for the visit, as it is all outdoors. The entrance takes you straight to a huge window seat which is set up for the café, it lures you straight into the café, which is never a bad thing. The café was lovely, relatively small, but with a lot of outdoor seating for the warmer days. We only had take out coffees, which were good, but there was a wide range of snacks and ice creams on offer, both to take out, or eat in. There is no reason why you couldn’t take a picnic and have it in the woodland area, or by the river, there are plenty of benches in the garden, but no picnic tables, so take a blanket. Entrance was free for the children and £8 per adult. Not cheap, but season tickets are available if you wish to go more than once, then that spreads the cost a little. It is early season at the moment, but the garden still looked amazing, just coming into the spring bloom. The garden team work really hard on it and it shows. First stop was the bridge for pooh sticks, good simple fun that they so far, have not got bored of. Then there was manic running up and down the side of the river, before we set off in the direction the map showed up. There are lots of old-fashioned glasshouses, but don’t go expecting the Wisley Glasshouse, they are built for purpose glasshouses, rather than showcases. Some were open for the children to run through and check out the plants, others just had a little viewing hole, which the children seemed to find quite intriguing. There was a dovecote, which had a visitor’s book in it, so they spent quite a while checking out where visitors came from and writing in their own entries. From the glasshouses, we went into the garden which was laid out with bridges and water features to entertain them. There were plenty of benches to take a rest, or possibly leave a grandparent to relax, while the rest of us go on the country walk. The country walk was listed as 2 ½ miles, however, we went a bit off track and it was possibly a little longer. We walked through the fields of sheep and lambs, which was really sweet. The children spent most of the time picking their favourite lambs, this helped them barely notice the walking. The views were lovely and after a fairly gentle uphill walk, we were on the downhill strait back to the gardens. There was no moaning from the children, they seemed to genuinely have fun running around. It was a relaxing and simple family outing, we will definitely be taking the grandparents there when they visit on a sunny day. We decided to move onto Chichester afterwards as it is so close to West Dean, where we found a great play area, as well as loads of shops and cafes. We combined the two to give us a full day out. Having managed to swerve the gift shop in West Dean, we did end up having to buy the most weird bean filled floppy banana for DD2 in The Works. She loves waving her floppy banana around, while DD1 got a unicorn squishee. One day we will get away with just saying no and maybe Mummy and Daddy can buy themselves a treat instead!